All tests were run in our custom built computer to best reflect real life performance. The computer remained in the same location in the same room throughout all tests. The room temperature in our testing lab was around 22c. Stock thermal paste respective to all coolers were used to rate its performance; all pastes were given a proper amount of time for them to fully settle. The fans on all heatsinks were directly connected to the motherboard's 4-pin connector. Computer was turned on and idling for at least one hour for the idling tests. High CPU load results were obtained using the Prime95 in-place large FFTs test with four worker threads for a minimum of ten minutes or until the temperature was deemed stable. Temperature results were measured with AIDA64, which reports the CPU's integrated digital thermal sensor for maximum accuracy. 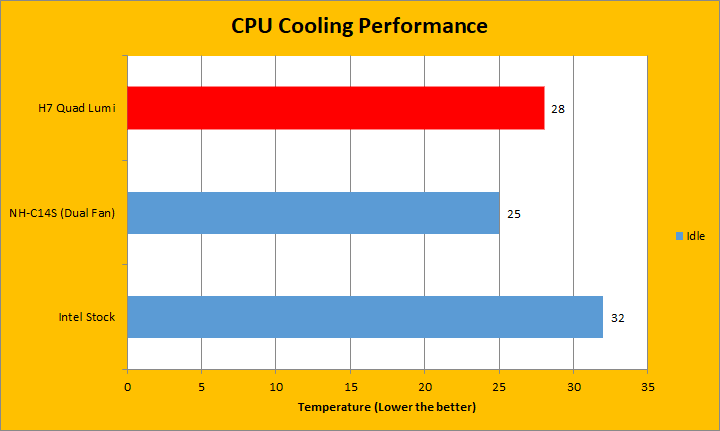 Each temperature result was calculated by taking the maximum value of the cores inside the CPU. 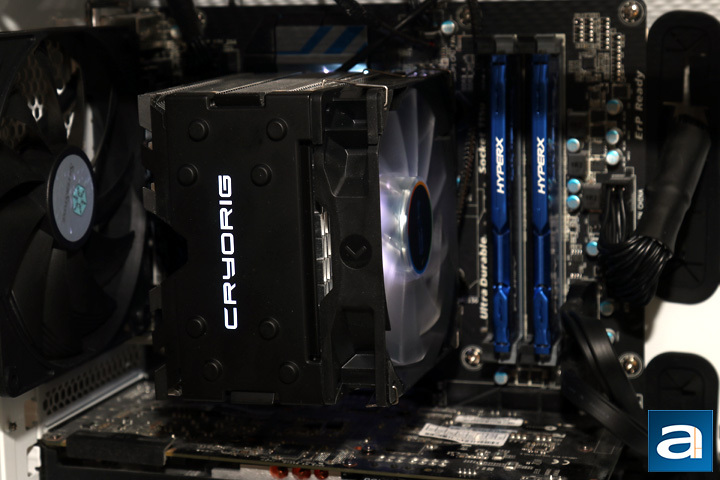 We chose to compare it against the Intel stock cooler, especially as CRYORIG specifically makes claims of how much better the H7 Quad Lumi is compared to the OEM option. Finally, I have also compared my current heatsink, the Noctua NH-C14S, as it has a similar surface area to our unit under test today. After letting my computer sit idle for a while, I awoke my screen with a mouse shake and checked on the temperature. 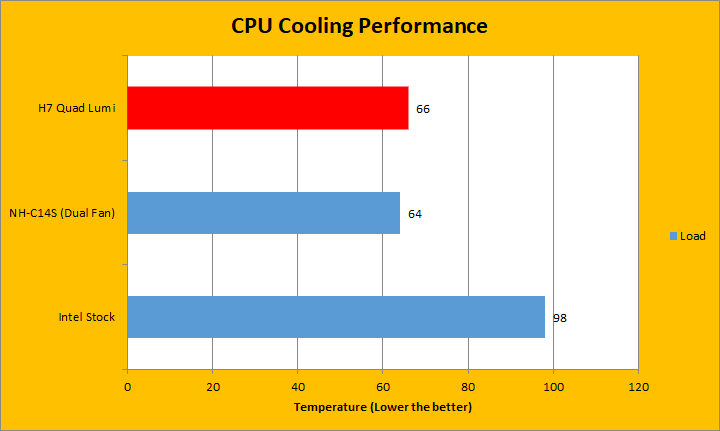 From the graph above, you can see the CRYORIG H7 Quad Lumi produced a pretty respectable result of 28c. The Intel stock cooler was a bit hotter at 32c. In comparison to the NH-C14S, the H7 Quad Lumi was a bit warmer by three degrees, which is not too surprising. This is pretty good, keeping in mind this cooler has a similar performance while being contained in a smaller area. However, this does not really give an accurate representation of what CPU coolers are capable of, so we threw Prime95 on at full blast and let it go. Running the test machine at Prime95 allowed us to really push our computer to the limits. Prime95 is not a new test, as we have used this in past tests for both CPU heatsinks as well as laptop coolers. Under full load, Prime95 absolutely destroyed the Intel stock cooler, pushing temperatures to nearly 98 degrees Celsius. This is unacceptable for daily use and can lead to accelerated wear on the processor. The CRYORIG H7 Quad Lumi, on the other hand, offered temperatures at 66c on the hottest core of my Core i5-4670K. This is a difference of over 30 degrees in comparison to the Intel stock fan, which is very good to see. This also punches a close second to the NH-C14S. Keep in mind, the numbers on the Noctua NH-C14S were achieved with two fans attached compared to the single fan on the H7 Quad Lumi. Either way, I am quite impressed with the performance of this cooler. As for the sound analysis section of the CRYORIG H7 Quad Lumi, on a scale of 0 to 10, where 0 is silence, and 10 is the definition of loud, I would rate the H7 Quad Lumi at 3.0/10 during idle and around 4.0/10 under full load. The QF120 fan, on a day-to-day use, is quite quiet and moves without much noise. When you push your computer to its limits as we did in Prime95, you will start hearing the fans whirring on, but otherwise it is quite unnoticeable. posted 2 hours and 11 minutes ago, with 5 posts. posted 2 hours and 34 minutes ago, with 4 posts. posted 8 hours and 2 minutes ago, with 4 posts. posted 15 hours and 17 minutes ago, with 12 posts. posted 15 hours and 17 minutes ago, with 9 posts. posted 15 hours and 21 minutes ago, with 11 posts. posted 15 hours and 21 minutes ago, with 56 posts.